A new paid-for weekly to be published on Saturdays is being launched after a regional daily moved to five-day a week publication. 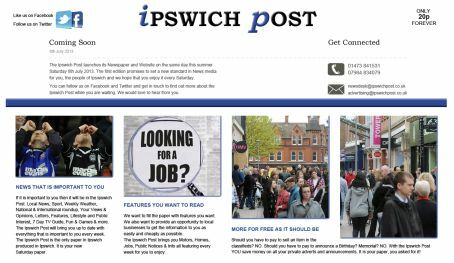 The Ipswich Post will be launched in July by former Archant staff member Adam Coe following the regional publisher’s decision to axe the Ipswich Star’s Saturday edition in January last year. The move by Archant included the creation of a a new Ipswich edition of sister title the East Anglian Daily Times to replace the Star’s Saturday edition and saw nine job losses at the company. Adam worked for Archant for four years on the advertising team and as a business development executive in Norfolk until leaving last year and starting a new business in graphic design. The Ipswich Post, which will have a cover price of 20p, will have a print run of 12,000 and will be on sale at newsagents and supermarkets, although free copies will be handed out in the first eight weeks to generate interest. Adam said the new title aimed to have a minimum of 48 pages each week, 70pc of which would be editorial. He said: “Myself and a friend decided to do some market research and stopped a lot of people in the street and asked them if there was a new Saturday paper, would they be interested in reading it and the response was really strong. “Hopefully people will regard it as an addition to the news that is available to them each week. The Post will carry on the news stories of the week. Adam added he had informed Archant about the launch of his new paper and said they had been positive about it and were “quite keen” for the competition. There are six people on Adam’s team, two of whom are graphic designers and the rest with regional press backgrounds, although none have previously worked for Archant. Adam also plans to work with University College Suffolk to offer their journalism and photojournalism students the chance of doing freelance work for the title. For further information, visit the Ipswich Post’s website. No mention of journalists needed for a newspaper. Obviously anyone can do that, as well as being able to do market research. So many talents. “Myself and a friend’ gives some idea of the quality of content we can expect. It appears that there are people involved with ‘regional press backgrounds’ and they are involved with students in the field so why would they be looking for additional Journalists? I think, if you are interested in working with them then berating them is not the way to get their attention Ex-Journo. Not hard to give the Evening Star a run for its money, if it’s anything like I remember from my trainee days. It’s hardly likely to have improved in 20-odd years; not much has, especially in Ipswich. Good luck with the Post, chaps; nice to see someone still realises there’s a place for paper.